Functional Training improves coordination and balance, and increases core strength. For your day-to-day life, sports, or leisure activities, the PFT allows you to train the way you move. 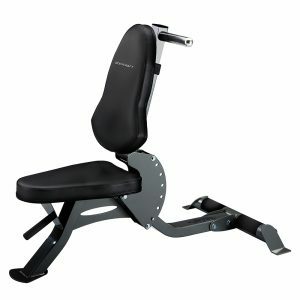 You define the path of motion allowing you to strengthen every part of your body for the way you want to live. It’s that simple. • Mounted book describing over 70 exercises. 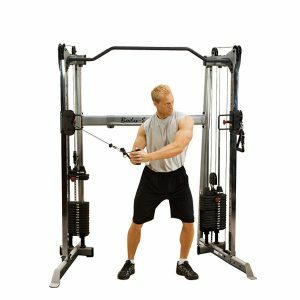 • Long Bar that attaches to both sides. • Short Bar that attaches to one side. • Nylon Strap for Assisted Chin-ups. 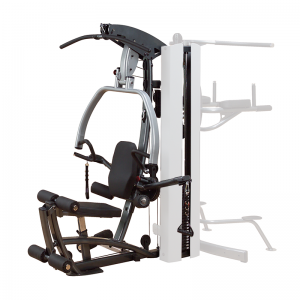 • Independent, Adjustable Cable Columns have 30 Height Positions, and Rotate 200 Degrees allowing you to train from every Angle and any Height. • Compact; only 4.4′ d X 3.2′ w.
• Beautiful Oval Tubing, Upgraded Paint, And Acrylic Covers all add up to an exceptional look! • Weight Stack: Choice of Dual 160-lb. Or 210 lb. graduated Steel Weight Stacks. The weight stack to user weight ratio is 2:1. Each 160 lb. weight stack provides up to a total of 80 lbs. resistance. 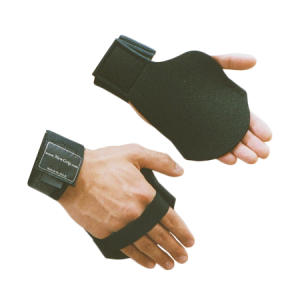 This ratio allows for extremely smooth action, lower increment weight increases, and greater range of motion. The first 10 plates on each stack are 5 lbs. each, providing 2.5 lbs. resistance. The final 10 plates on each stack are 10 lbs. each, providing 5 lbs. resistance. 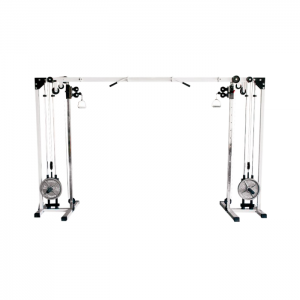 • Frame: Heavy 11 gauge, 3.25″ x 1.75″ oval steel tubing. • Finish: the Platinum Gray finish is electromagnetically applied in powder form to evenly coat all surfaces, then baked on at high temperatures for a tough, long lasting finish. • Pulleys: 4″ diameter, fiberglass impregnated nylon pulleys with sealed ball bearings. • Cable: The most flexible nylon coated, 7 X 19 strand aircraft cable rated at over 2000 lbs tensile strength. 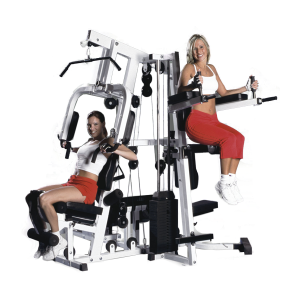 • Weight Stack: Choice of dual 160-lb or 210 lb. graduated Steel Weight Stacks. The weight stack to user weight ratio is 2:1. Each 160 lb. 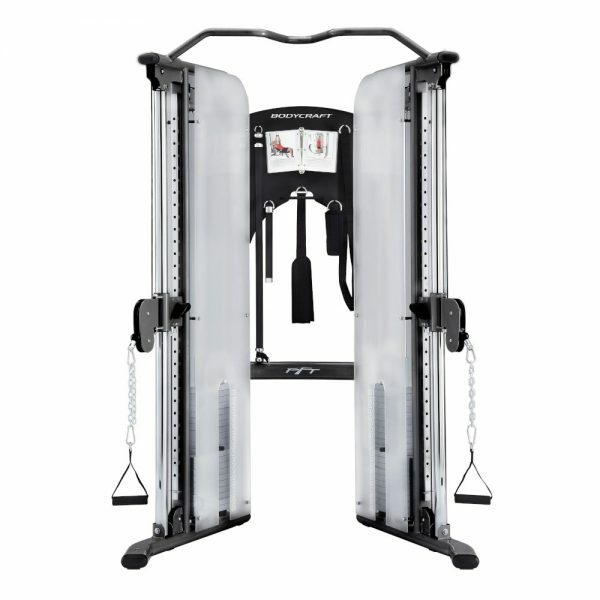 weight stack provides up to a total of 80 lbs. resistance. 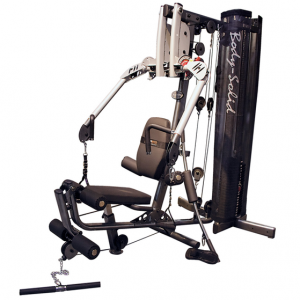 This ratio allows for extremely smooth action, lower increment weight increases, and greater range of motion. The first 10 plates on each stack are 5 lbs. each, providing 2.5 lbs. resistance. The final 10 plates on each stack are 10 lbs. each, providing 5 lbs. Resistance. • Weight Stack Enclosures: Full length acrylic panels provide safety and beauty. 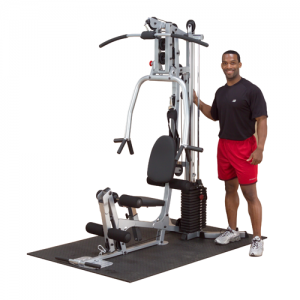 • Included Accessories: Attached Exercise Book, Long Bar, Short Bar, Chin Bar, Assisted Pull Up Strap, Ab Slings, Ankle Strap, and two Single Handles. • Warranty: Commercial: 2 years parts, 10 years on frame. Residential: Lifetime all part.